Deep in the green mountain lands of the Rigante lies the settlement of Three Streams, whose people worship the gods of Air and Water, and the spirits of the Earth. Among them lives a boy whose destiny is written in starlight. He is Connavar, the Demonblade, born in a storm that doomed his father. A man with the makings of greatness will always have enemies and from the start of this epic chronicle it is prophesied that the Armies of Stone will one day cross the water...and that their coming will be like an avalanche. Here the strangest forces, wise and evil, play their allotted part — from the Ghost General and the malignant Morrigu to the Woods whose magic harks back to a world before the coming of Man. 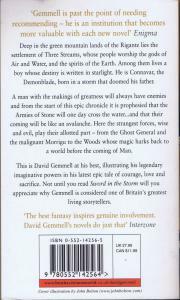 This is David Gemmell at his best, illustrating his legendary imaginative powers in his latest epic tale of courage, love and sacrifice. 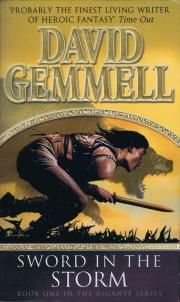 Not until you read Sword in the Storm will you appreciate why Gemmell is considered one of Britain's greatest living storytellers.